The Talbot on Granby's apartments were fine, a little small, but they're OK. They staff was really nice. They have an exercise room. It was mostly new. Facility offers 3 bedroom living options, a unique feature compared to other facilities. Very conspicuous feel to the building, residents appear to be living in a regular housing facility than a customized healthcare unit. Facility offers a movie theater, an exercise area, and a swimming pool. Restaurant offered within the facility. Warm, family-oriented atmosphere with friendly and accommodating staff. Spacious living spaces. Social calendar provided for each resident full of exciting activities regularly. The best way to get to know a community is by scheduling a tour. See the facilities, meet the staff and residents, and get a feel first hand what it's like to live at The Talbot on Granby Independent Living. 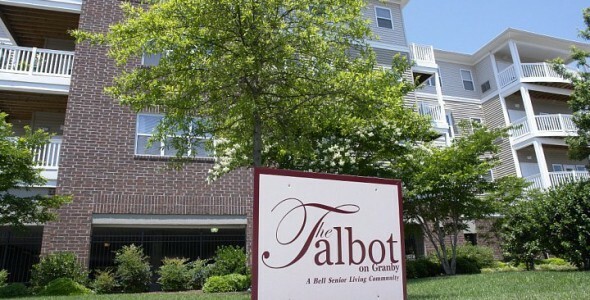 At The Talbot on Granby retirement community, we offer independent living amenities and accommodations for the discerning active senior. Our beautiful courtyard and swimming pool allow our residents to fully appreciate Norfolk’s pleasant summers and echo the town’s seafaring spirit. At the Talbot on Granby, we offer a choice of floor plans in a variety of layouts. All accommodations come standard with full kitchens, washer/dryer hook-ups, nine-foot ceilings, crown molding and numerous other features. If you would rather not cook, simply stop by our restaurant-style dining room for both breakfast and dinner. Monthly rent includes all utilities except for telephone and cable TV, housekeeping, transportation, two daily meals and access to community events. Our community offers various social activities such as exercise classes including flexibility programs and a walking club. Outings are available for shopping and museums. Keep your mind active with our educational seminars and arts and crafts workshops. Our cocktail hour with complimentary wine and beer is particularly popular. Additional on-site amenities include our beauty salon and barber shop, clubhouse, fitness center and a modern library with computers. As an independent living community, the Talbot at Granby offers full freedom and independence while supporting the retirement you deserve. We are aware that sometimes you may need a bit of extra help, which is why we have an emergency call system to allow you to contact our on-site staff 24 hours a day. The Talbot at Granby is the perfect place to enjoy an active retirement while making new friends and taking advantage of all our community has to offer.